First Families 2001 was a unique cultural, historical and genealogical online record of Australia funded by the State Library of Victoria to mark the Centenary of Federation. Searchable by surname, it was a database of names and a collection of stories about people in Australia's past. The database closed on 31 December 2001 following four years of data entry and editing. It is no longer accessible online. FF2001 webpages contained extensive information and stories about earliest family members known to have lived in Australia. Such people were deemed to be 'first families'. 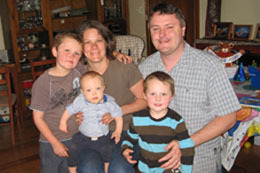 The directory below lists the parents of the first families of Martyn and Helen Smith, their son Mark and daughter Kirrily, who, with her husband Steve, has three young sons, Liam, Jamieson and Spencer ... all pictured below ... of Melbourne, Australia. 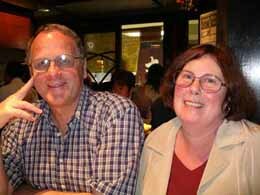 Each link goes to information derived from the original FF2001 webpage of the ancestors named. Additional collections of images and links exist for some ancestors. To view any one of them, simply click where you see 'visit'. Martyn's 'Wesley College, Melbourne - Reflections' ...... Go! 'Travelling Cricket Scrapbook' - Mark's touring following the Australian cricket team ...... Go! 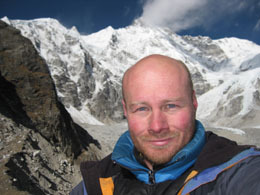 Mark's 'Flickr' homepage - photos of trekking in the Nepal Himalaya and travelling elsewhere ...... Go! Kirrily's 'Creative Memories' homepage - digitally creating hard copy albums, posters and mementoes ...... Go!